All transactions are safe and secure with a reliable history in online purchasing behind each of our associates. 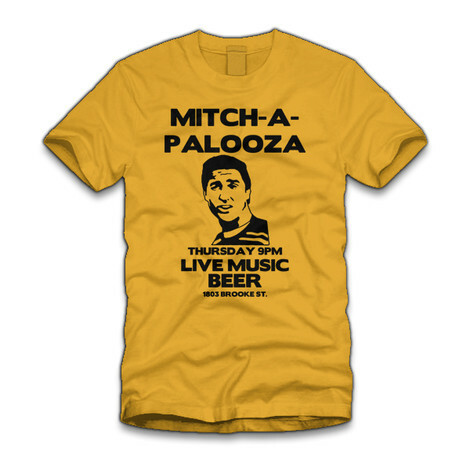 Buy the Mitch-A-Palooza Old School t-shirt to own Old School clothing and merchandise. Celebrate the Mitch Martin Freedom Festival with this Mitch-A-Palooza t-shirt that is sure to have your friends wondering if you were really there. That's when you tell them it is just a movie and to seek professional help, or you could invite them to your very own Mitch-A-Palooza with live music and beer. Pictured at left is a yellow tee with black lettering. In addition to the Mitch-A-Palooza Old School tee above, browse the Old School Clothing Gallery for more apparel like men's and women's clothes, kids shirts or hoodies.